Assembly and handling systems have a decisive impact on productivity and quality in the production process. However, systems developed specifically for a particular production process often require a significant amount of engineering. Manufacturers therefore need modular, highly configurable automation solutions allowing them to reduce engineering time and operating costs. Bosch Rexroth meets this need with its modular component system. 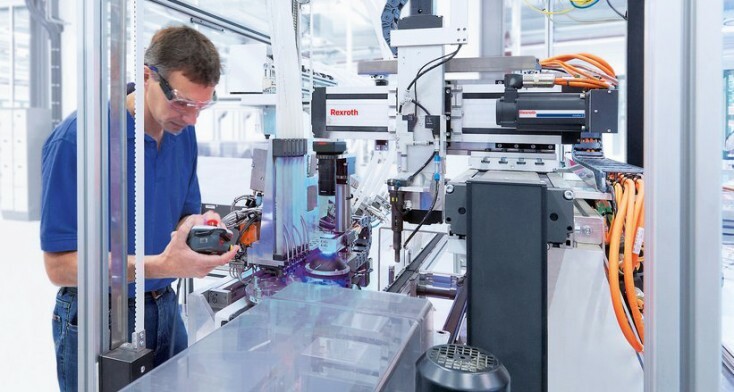 Manufacturers and users can choose from Bosch Rexroth's extensive product portfolio to put together a perfectly configured solution. Utmost productivity, precision, machine availability and operational reliability – our modular solutions for efficient and safe handling and assembly fulfill these requirements. All components, such as electric drives and linear motion systems, for instance, are designed to work together perfectly, and they always provide precise positioning with high dynamics. With the EasyHandling modular system developed by Bosch Rexroth, the time required for engineering can be reduced by up to 80 percent. And with the intelligent EasyWizard software tool, users can shorten the time spent on commissioning electric axes to just a few minutes. And the extended version, EasyHandling advanced, comes with preprogrammed Motion Logic, thereby eliminating the need for time-consuming programming. Manufacturers seeking to optimize their processes benefit from the versatility of the system solutions provided by Bosch Rexroth. In addition, our customers can count on our consultants for on-site assistance with the adaptation of their existing assembly and handling systems to current and future requirements.